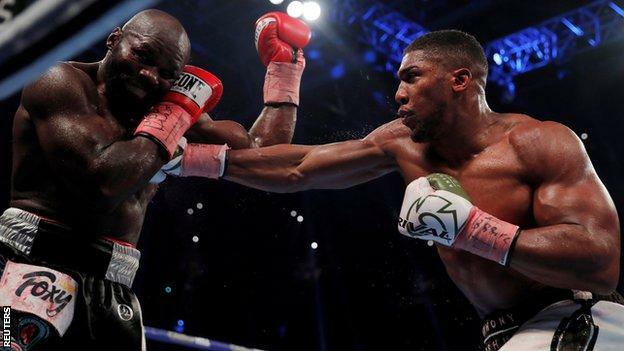 Anthony Joshua, who beat Carlos Takam in Cardiff in October, has never been taken the distance as a professionalBritain's Anthony Joshua insists he is not "ducking" any fighter and says his heavyweight rivals are just "making noise" on social media.Joshua, 28, holds the WBA, IBF and IBO versions of the world title, with Deontay Wilder the WBC champion and Joseph Parker having the WBO belt.Wilder, 32, wants a unification bout, but no firm offer has been made. "There's one thing talking and acting, but negotiations don't happen over social media," said Joshua. "I'm serious about becoming undisputed heavyweight champion and we're making sure these guys who are making noise will back up what they're saying. "It's no problem if Wilder wants to fight early next year, but no offers have been made to me. "Let's present him with an offer, and see how they feel about that. If Wilder's not making an offer, we'll do it on my terms." Deontay Wilder knocked out Bermane Stiverne in the first round of their fight last SaturdayWilder beat fellow American Bermane Stiverne on Saturday to extend his own unbeaten record to 39 wins from 39 fights and taunted Joshua for never fighting outside of Britain in his 20 professional bouts. "Packing out stadiums looks good but the money and Mecca of boxing is in America," Wilder told BBC Sport. "But if you want to stay at home like a little girl, this king has no problem travelling to knock out the champion. "If Joshua's a strong champion, a true champion, you guys in England should smoke him out, make him fight. You should see if he's the best. "In an interview with IFL TV,[/i] Joshua added: "Deontay has called me out, which I did not expect as I've not seen any contract or offer in place. "I've had to take it on, in my time off, to make plans to travel to America and discuss negotiations so I can become undisputed heavyweight champion of the world. "I have been taking challenges throughout my career - even as an amateur I was doing that, and I fought for a world title in my 16th professional fight. "I've never been in the business of ducking anyway, I'm not afraid of anyone." Joseph Parker (left) is the youngest of the heavyweight champions, yet has fought four more times than JoshuaAnother fighter seeking a fight with Joshua is 25-year-old Parker, who has won all 24 of his professional contests - 18 inside the distance - although he needed a controversial majority points decision to beat Hughie Fury, cousin of Tyson, in September. "I have pictured it in my head, I have pictured fighting Joshua," Parker told BBC Sport. "I imagine the stadium, also I see myself doing very well and knocking him out. "I respect him as a fighter, what he's done and his power, but I see myself beating him. I don't think he can catch me and I see him as a fighter that doesn't move a lot and gets tired fast. "The bulk and the muscle will work against him and he won't be able to carry that for 12 rounds. "Parker's promoter, David Higgins, says he has been talking to the Joshua and Wilder camps, but believes a fight between Joshua and Parker could happen first - in March or April in the United Kingdom. "I know Anthony Joshua wants to fight Joseph Parker, I know Parker wants to fight Joshua and I know both guys are willing to do it next," added Higgins. "So it's a matter of [Joshua's promoter] Eddie Hearn and I getting our heads together and seeing if we can work out a deal that both sides are happy with." Tyson Fury has won all 25 of his professional fights, but has not fought for two years since beating Wladimir KlitschkoBritain's Tyson Fury has not fought since beating Wladimir Klitschko in November 2015 to become the then IBF, IBO, WBA and WBO world champion.However, he has since been stripped of those titles and is currently suspended from boxing after he tested positive for a banned steroid in June 2016.Fury claims the adverse result came from eating uncastrated wild boar and a legal battle with UK Anti-Doping over the evidence means the 29-year-old has not fought for two years.He has regularly taunted the other heavyweight fighters on social media and Joshua said he needs to fight Fury in the future. "One side of me says, with all due respect, that he is irrelevant because he is not fighting, he is not active," added Joshua. "But the other side of me says I need him, I want him so I can compete with him. "I want him back so I can challenge Tyson Fury, but at the moment it is just talk. "I'm not interested in the business of talking, all these guys are doing their business on social media. When he is back we will get the ball rolling, until then it's not relevant to me."